Muller has been manufacturing a unique technology called the Octopus. There are a wide variety of stretch wrapping machine options to accommodate many needs and applications. The rotary ring stretch wrap technology provides a low cost per load stretch wrap which reduces cost up to 25%. The “B” Series stretch wrapper is a completely automatic option. Its aluminum frame helps to provide a quick to use and easy to assemble machine at a reasonable price. The pallet stays in place while the machine rotates around the pallet and wraps the film around it from top to the bottom. The “C” Series is ideal for companies who are looking to save on space. This series size helps it to fit where other stretch wrappers can’t. Its assortment of options helps the “C” Series to be the perfect fit for any company. 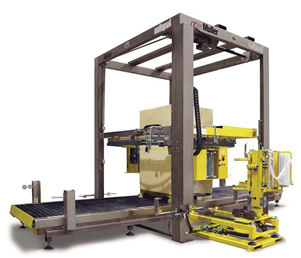 The “S” Series is the fully automated pallet stretch wrap option. The steel frame of the “S” Series allows this stretch wrapper to perform at high speeds, without causing any disruption. It is one of the most dependable stretch wrappers and requires little upkeep. The pallet stays in place while the machine rotates around the pallet and wraps the film around it from top to the bottom. What makes this machine fully automated is the use of conveyors to load and unload the pallet. The “TWIN” Series is like having two fully automated “S” Series going at the same time, which doubles the speed. It uses two separate wraps going at the same time. It is capable of a range of wrap patterns that would not be possible with a single wrap machine. The machine can act as a single wrap, which can be used as a backup if one of them malfunctions. This can be very important to keep a continued flow of production. The infrared photo-eyes can automatically adjust for abnormal pallet sizes.